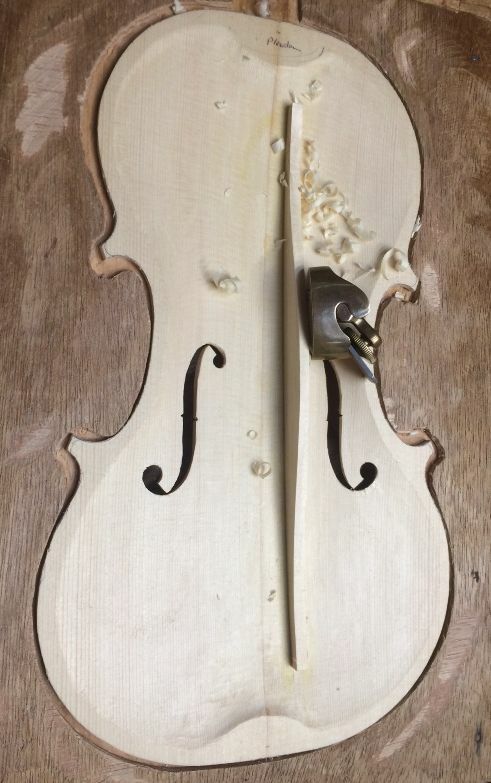 The bass bar in a violin-family instrument serves to support the bass-foot of the bridge, and the bass-side of the front plate (also called the “table” or, the “soundboard.”) Without adequate support in the proper place anong that side, the bass tones will sound quite flabby and unconvincing. The following is only a description of how I install the bass-bar, not telling anyone else how it ought to be done. We always make the bass bar of European spruce, with the grain vertical to the plate; thus, flat-sawn to the bass-bar, itself. 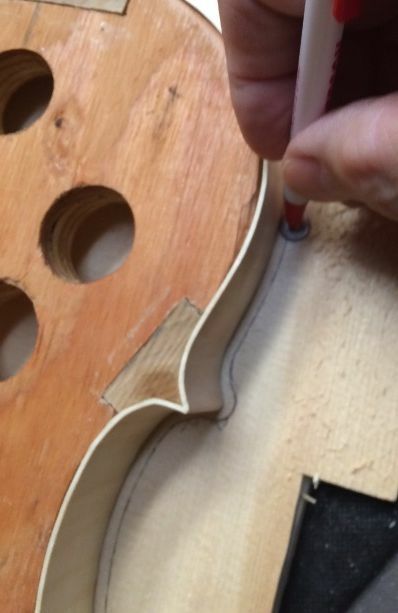 I begin by laying out two locations, one seventh of the distance from the center seam to the widest part of the bass-side edge at both upper and lower bout. That usually translates into about 15 mm off the center, at the widest point of the lower bout and 12 mm off center for the same place in the upper bout. 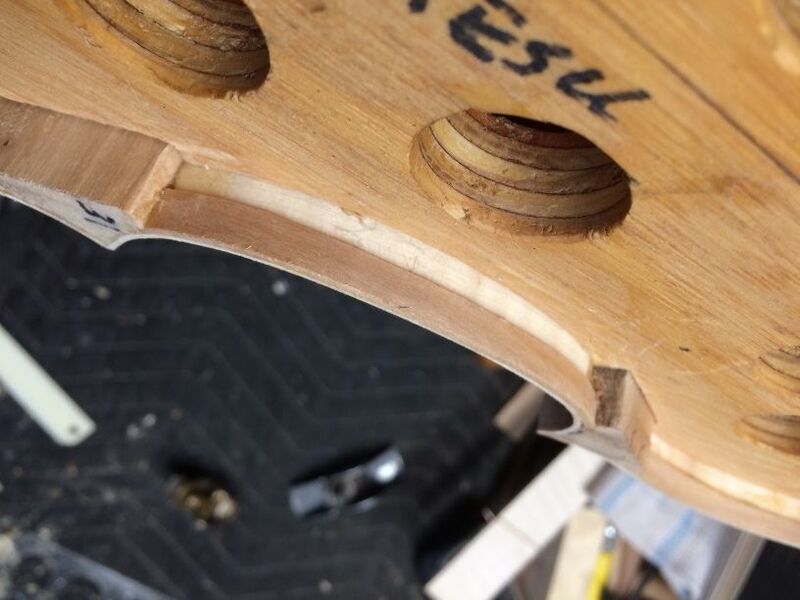 I strike a line through those points , checking to see if it is far enough away from the inner eye of the bass-side f-hole to actually accommodate the completed bass-bar If it is not, then I move the line over a couple of millimeters, as needed, to gain clearance at the f-hole. Then I measure 40 mm inboard along the line from the upper and lower edges of the plate, to designate the end locations for the bass bar. 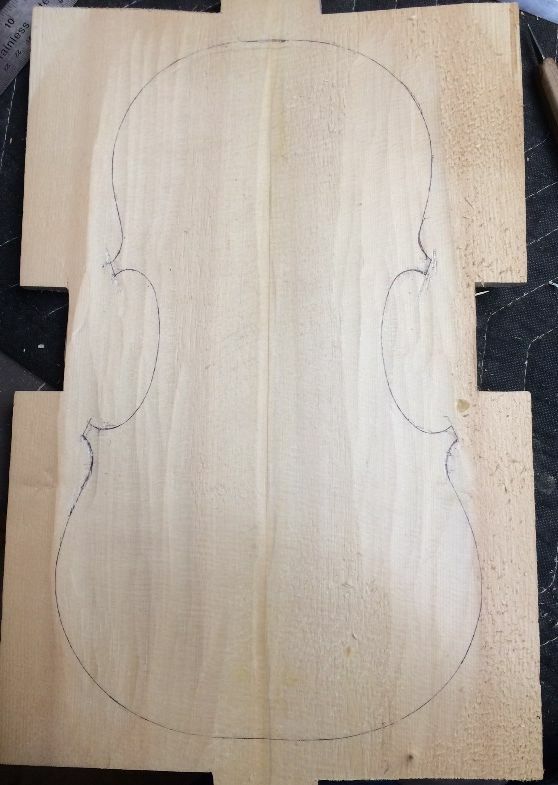 I cut the bass-bar blank to length, and plane it to the appropriate thickness, then hold it on the lines I have laid out, essentially perpendicular to what will be the plane of the ribs. 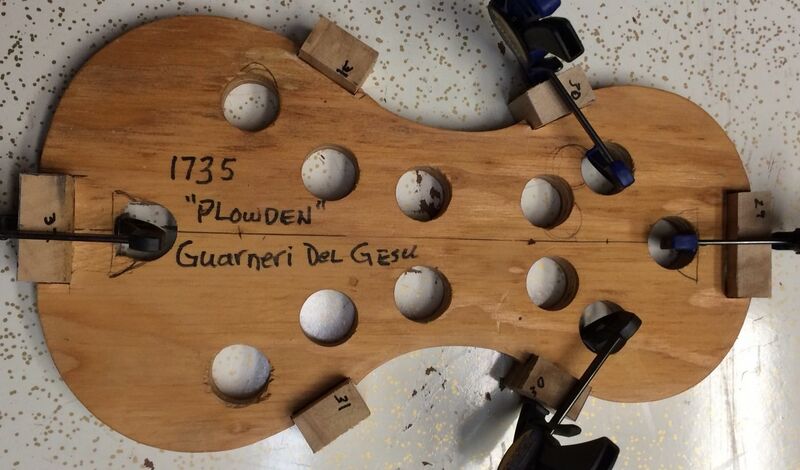 I use a compass, set to the maximum gap at the bottom center of the bassbar, to scribe the contour of the plate onto each side of the bass bar. 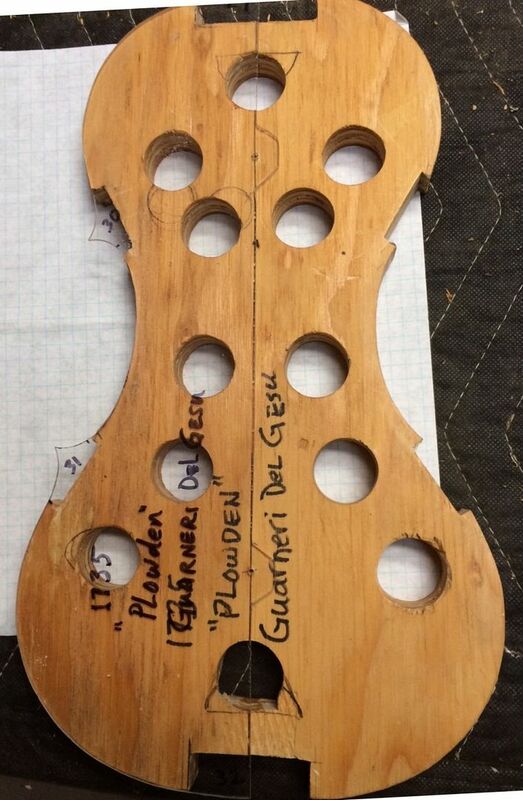 (Notice that, due to the compound curves of the violin plate, the two marks will not be the same. This is important.) Once I have both sides traced in accurately, I carve away the excess wood outside the line, to follow the line as closely as I can manage. I try to achieve a straight line between the two, regardless of where the two lines go, because that will follow the complex curves of the plate. I double-check the bass-bar against the plate, and usually it is surprisingly close to fitting, at this point. So I use a strip of the paper-gauze tape available in pharmacies, about an inch wide, to cover the layout lines I had scribed into the plate, and then proceed to chalk-fit the bass-bar on top of that tape. The tape is very thin, so that I can see the lines through it (although I do trace them again onto the tape, to make them even easier to see.) But the tape is also so thin that, if I can get a perfect fit on the tape, when I remove the tape, I will have a perfect fit on the plate, as well, and no chalk residue to remove. The hardest thing for me to learn in chalk-fitting, was to only remove the transferred chalk and the wood immediately under it, not the whole area. Frequently the culprit in an imperfect fit is actually quite a small area, so it is counter-productive to remove too much wood. I chalk the tape, along the layout lines, and then press the bar into place, sliding it lengthwise a few milimeters back and forth to pick up some chalk;. I plane or scrape off the high spots where the chalk transferred, then try again. When I get a more or less full transfer of chalk from tape to bass-bar, I know the fit is acceptable. Then I carefully remove the tape, and (finally) glue and clamp the bar into place. Usually, I trim the bar a little, first, so it is nearly the correct shape on the top surface, so the clamps will fit more easily. One bass bar is complete: the other has only been trimmed to make it easier to clamp. After the glue has dried and the bar is rigidly secured, I use finger-planes to trim the bar to the size and shape I want. 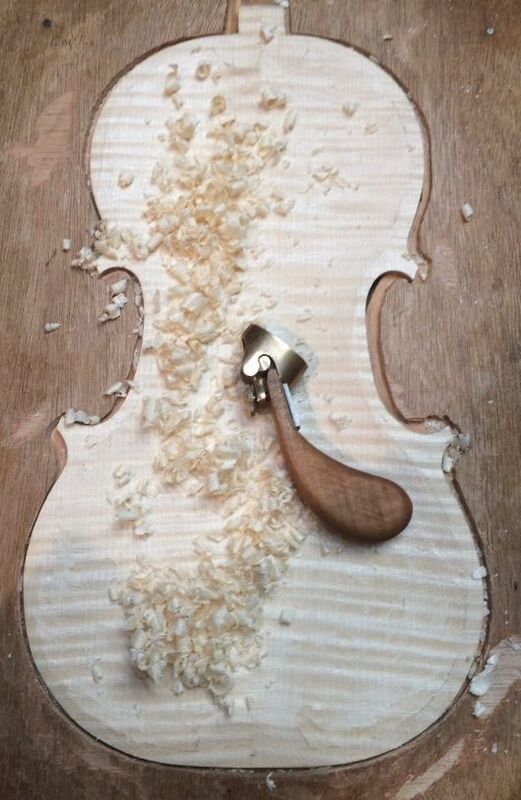 Beginning with a medium-sized finger-plane. 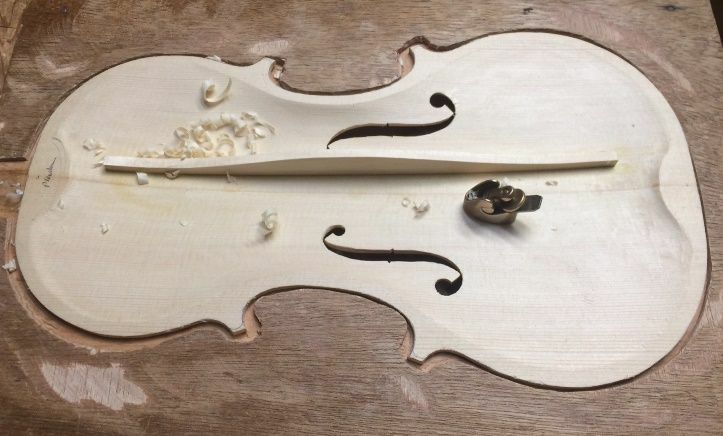 Finishing with a small finger-plane. Final touch-up with small plane and scrapers. The camera angle is what is making the two bars look so different. So, the next task is to complete the inner edgework, and then install the top plates on the rib garlands. 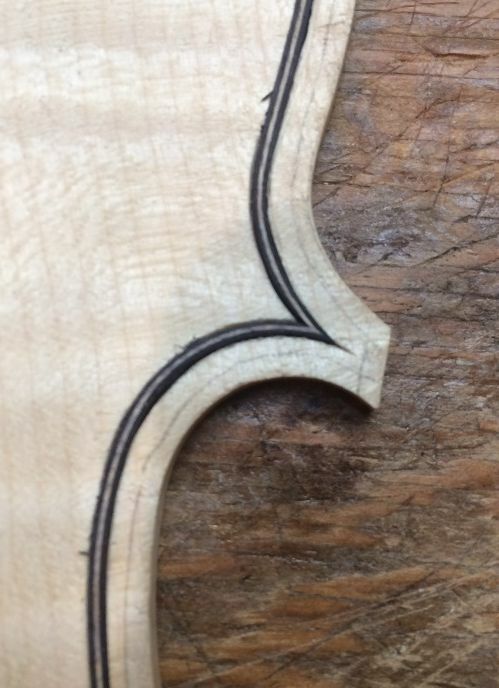 I plane a tiny bevel around the edge of the plate that will face the ribs; then file it to a curve, nearly quarter-round, flush with the outer rim of the plates. Then I position the plate on the garland as precisely as possible (sometimes things seem to have moved a bit, so I have to compromise a little.) Finally, I loosen a few of the spool clamps at a time and slip hot hide glue into the joint, using a thin palette knife. 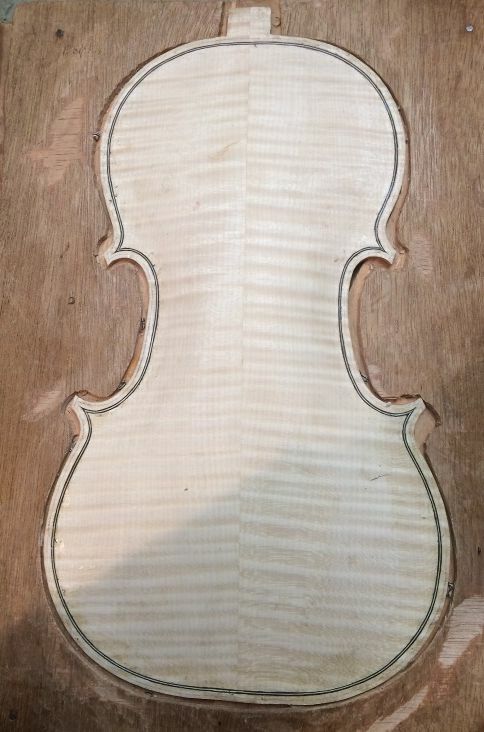 I clean up all around, so as to not leave glue on the outside of the violin. 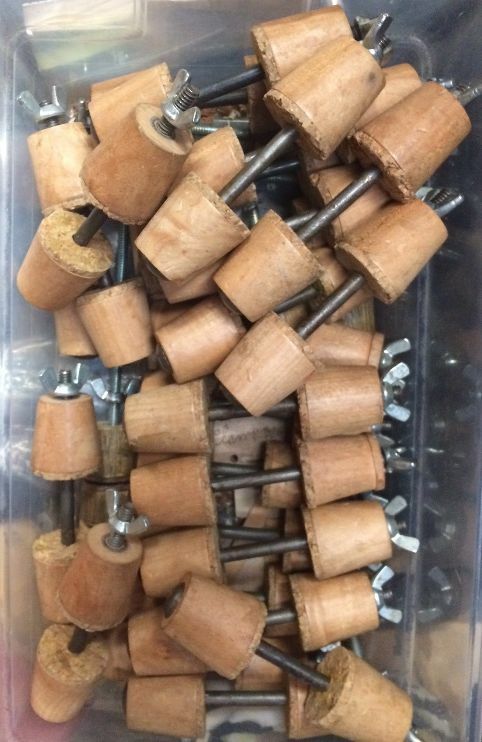 Spool clamps can look like these, or even more simple: sections of closet rod with all-thread bolts. There are a lot of possible options. Finally, the plate is fully glued and clamped, and I wait for it to dry. 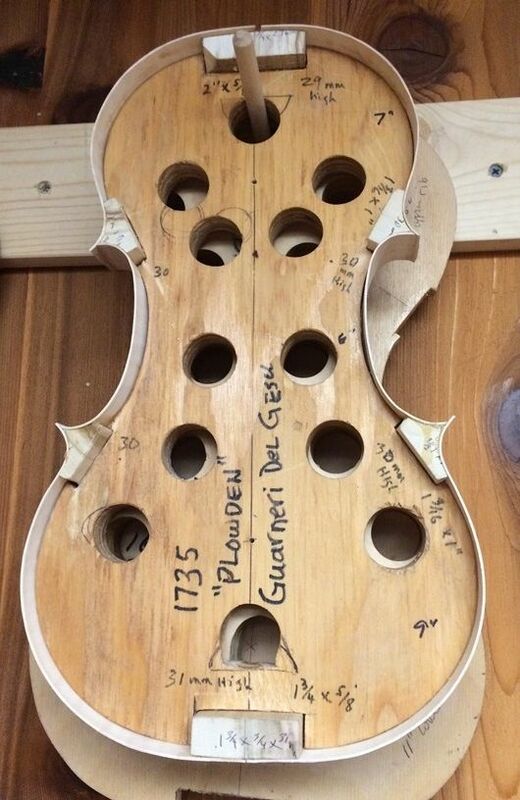 Guarneri copy top plate installed with hot hide glue and spool clamps. Next stop will be arching the back plates. 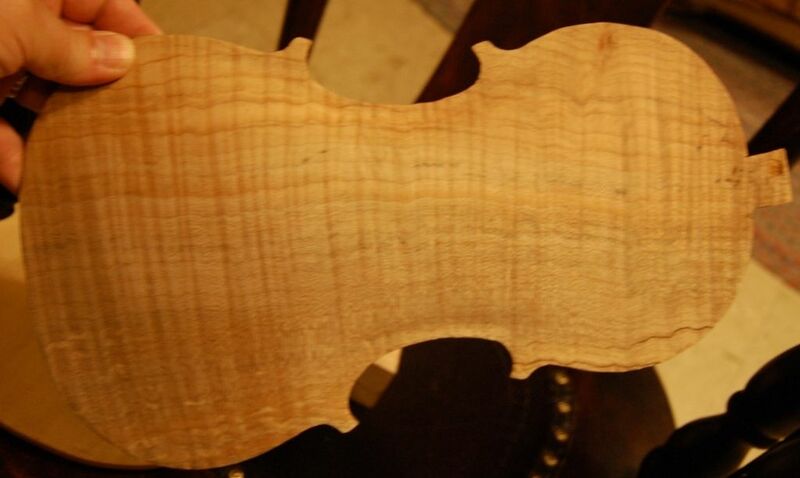 I began by making sure that I had appropriate wood for both instruments: I wanted a one-piece back for the Guarneri model instrument, with deep flames sloping downward from left to right, and I wanted a heavily flamed two-piece back for the Stradivari model…both of European Maple, with ribs to match them, and European spruce tops. 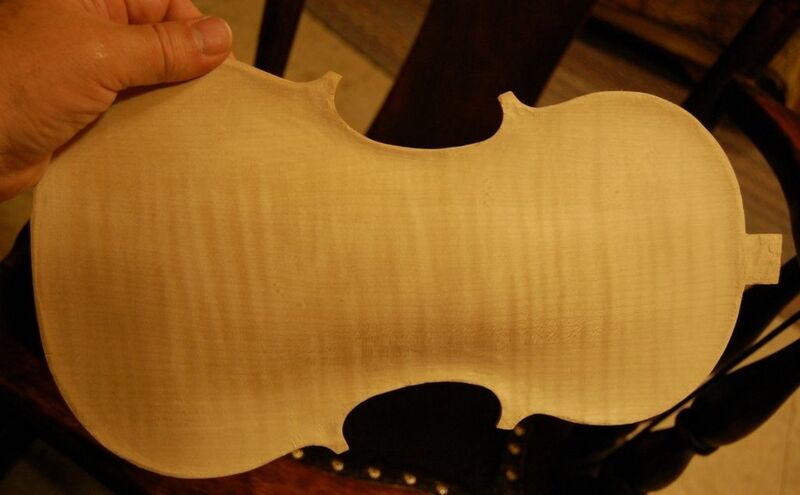 I had them, all right, so I bookmatched the two spruce tops, and the back for the “Titian” Strad attempt, and left them to thoroughly dry. 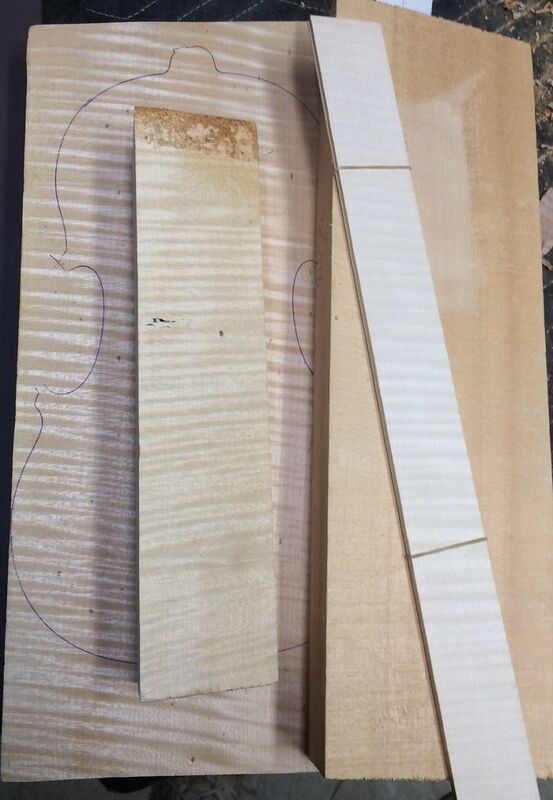 Afterward, I visited my son’s guitar shop and used his power planer to flatten the plates, and bring them each down to the thickness I wanted for the arching height. 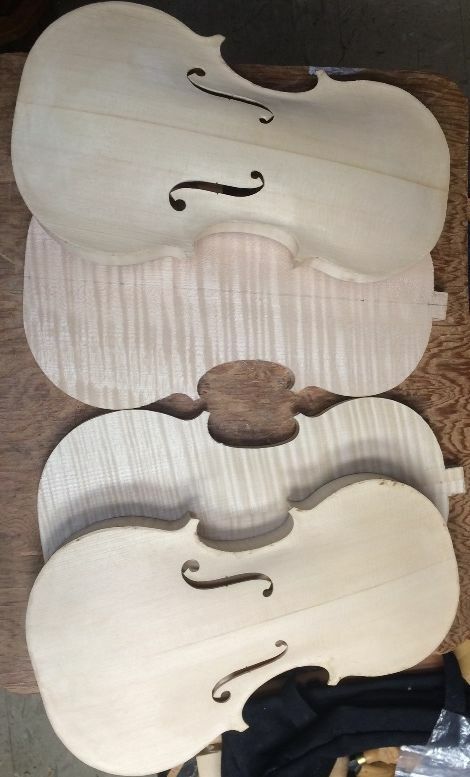 I took a week off from work, intending to “get a lot done” on the violins, but ended up sick for most of the week. Besides, Winter is coming on, and we needed to get firewood in, so Ann and I loaded and hauled and stacked firewood for a couple of days, and I got about two good days of work on the violins. During that time, I installed blocks in the molds, shaped them to receive the ribs, thinned and bent the ribs, and installed them. Last, I installed linings, to add stiffness to the edge of the rbs, and additional gluing surface. 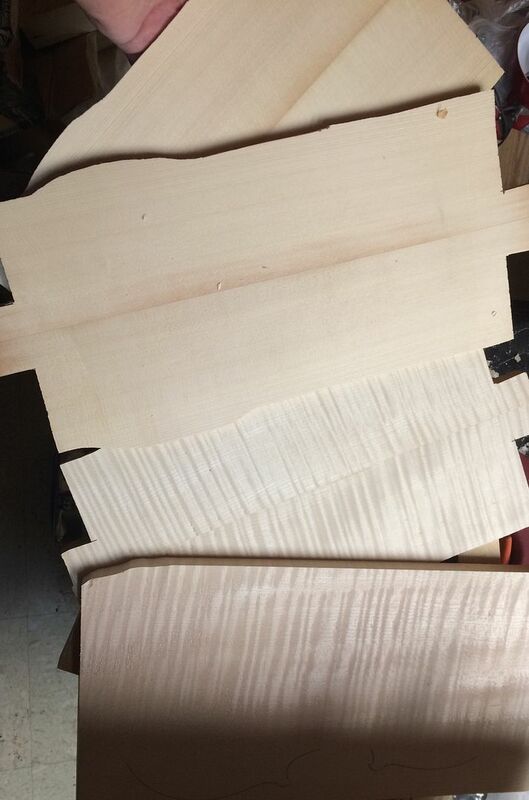 The ribs, like the back plates, are European Maple, but the blocks and linings are willow…not sure what variety. I like weeping willow the best, because it carves and bends so nicely, but other willows work well, too, sometimes. 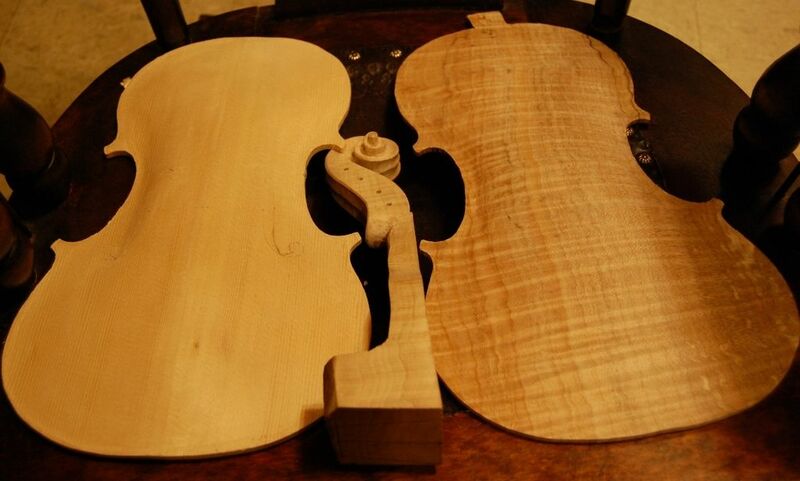 Guarneri form with blocks and ribs. 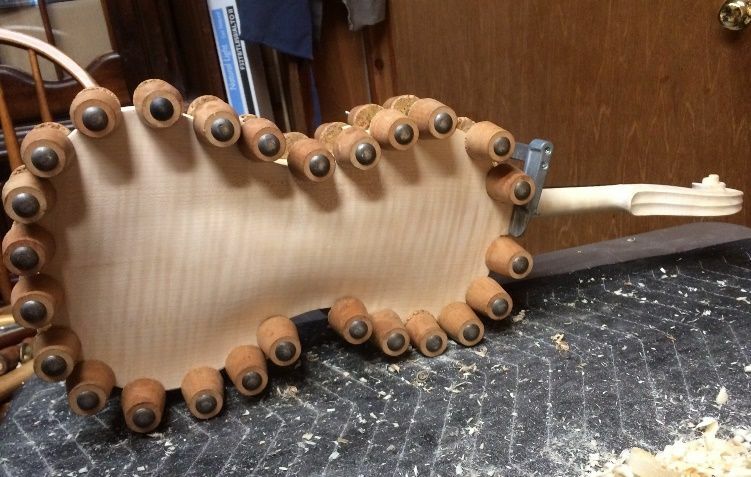 Linings installed, glued, and clamped. Then, once I had the linings in place, I trimmed the rib corners to their final shapes, and flattened the front face of garlands, after which I used the garlands themselves to trace out the shape of the top plates. Finally, I cut out the top plates and shaped them to the exact outlines I wanted, and I was ready to begin arching. I will do the same thing for the back plates later. All four plates, both garlands, with neck blocks. 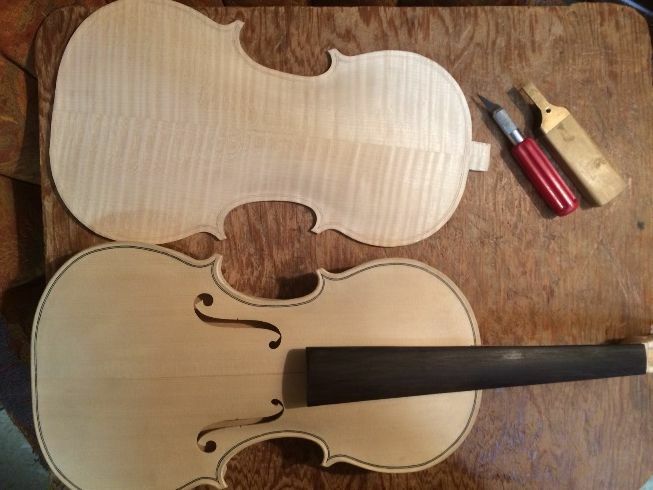 Strad model on the right, Guarneri on the left. I didn’t get much of anything else done, this week, as I was at work, mostly, annnd, Thursday, some fellow failed to yield on a roundabout, and totalled my wife’s car, as she was coming home from the grocery store. The roads were very wet, which may have contributed to why he was unable to stop, and why the impact spun her car around, 180 degrees, and hurled it off the road, into a field, next to the roundabout. 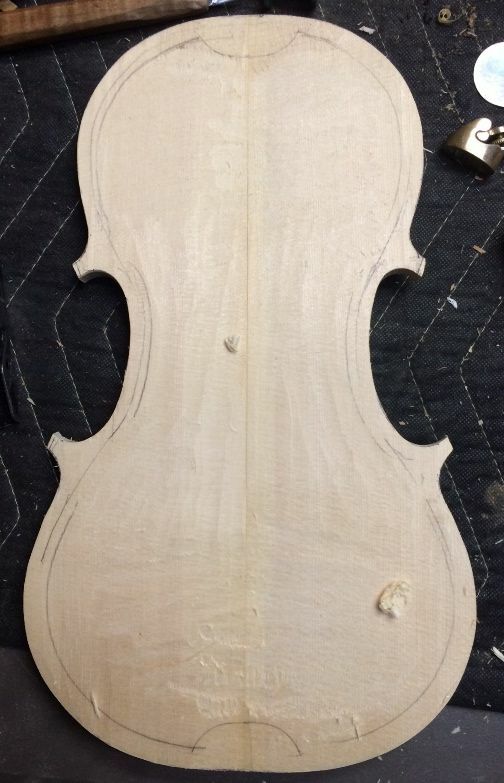 This evening, however, I got home fairly early, and I got most of the arching done on the Stradivari-model top plate, so at least that feels better, in terms of productivity. 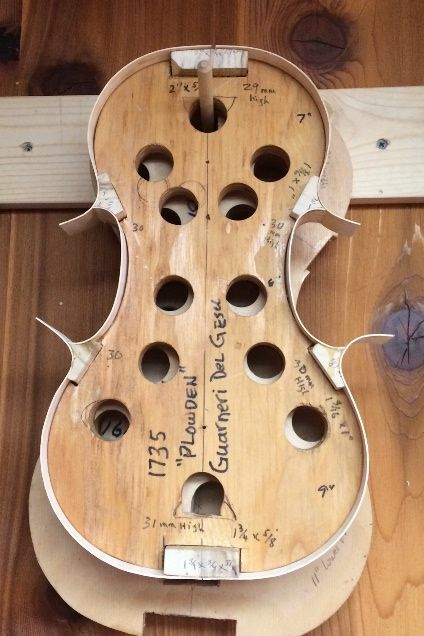 I will try to complete it tomorrow and repeat the effort on the Guarneri top plate. The linings are shaped using a small sharp knife to cut the taper, and then scraped smooth, using a scraper. Tracing the plate perimeter, using a washer and a ball-point pen. The front plate perimeter as it was initially traced: notice the round corners. Now the corners have been refined and corrected. I am deliberately leaving them on the long side; I will trim them later. I used a bandsaw to cut out the plates, as close to the lines as I could, without touching them. Then I used a spindle sander to bring the perimeter exactly to the lines, and, finally, I used files to smooth out any ripples left by the sander. I am really not comfortable looking at these extra-long corners, but, once the garland is glued to the plate, it is very easy to trim them to the exact length I want; and much more difficult to put wood back, if I remove too much. Front plate interior, cut, refined, and ready for carving. The lines show the margins, and the corner and end-blocks’ shapes. Now I am ready to begin plate-carving. I will begin with the front plate, simply because it is easier on my hands. Furthermore, the pattern of building I follow requires that the front plate be completed first anyway. But, honestly, the older I get, the more it stresses my hands to carve the maple, so it is nice to have the front plate completely done, and to feel good about that while I begin to tackle the back plate. Both plates, along with the completed garland. Looking at the interior of each plate, and the front side of the garland. To you sharp-eyed observers, the reason the slant of the “flame” on the back is going up from left to right, instead of down from left to right, is that you are looking at the inside of the plate. When I turn it over and carve the outside, you will see that it slopes the same way as the one in the poster. 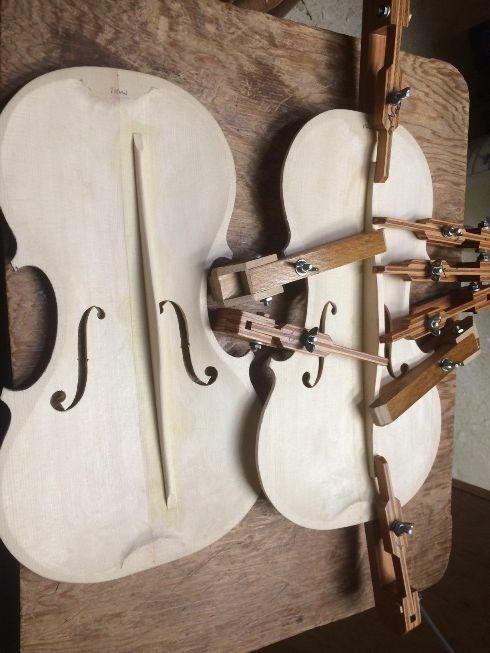 I had been pondering (glumly) what to build for the next show at Marylhurst University, and had nearly decided upon one of two “niche-market” items…either a very large “violoncello da spalla”, or an emulation of David Rivinus’s “Pellegrina.” I had spoken to Mr. Rivinus a couple of years ago, and he told me that, for years, he had encouraged other luthiers to use his design, as a partial solution for some of the “work-related injuries” associated with playing large violas…but no one took him up on it, so he just produced them himself for the rest of his lutherie career, ultimately making 100, or so, of the odd-looking instruments. They were all sold, ultimately, and he has stopped taking orders, so I considered “taking up the mantle”, so to speak, and producing instruments modelled after his work. But, as I said, that really is rather a “niche-market” viola. 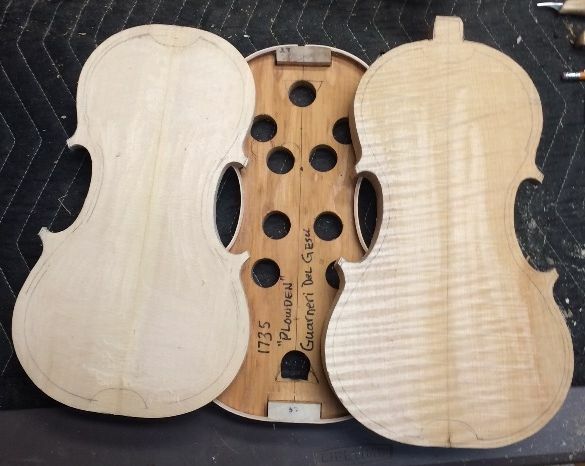 The violoncello da spalla is possibly even more specialized, as, though it is strung very much like a regular violoncello (cello), it has a fifth string (E), above the standard C-G-D-A of the cello, is only 19-20″ long on the body, and is generally played off the right shoulder, so that the lower bass-side bout is under the chin, and the bowing arm comes up from underneath, so that the player is nearly as comfortable as when playing a small viola, but the sound is that of a cello or extremely large viola–take your pick. Very little classical music has been written for these instruments, so I doubt there would ever be a lot of market for them, though I would love to build them. But! 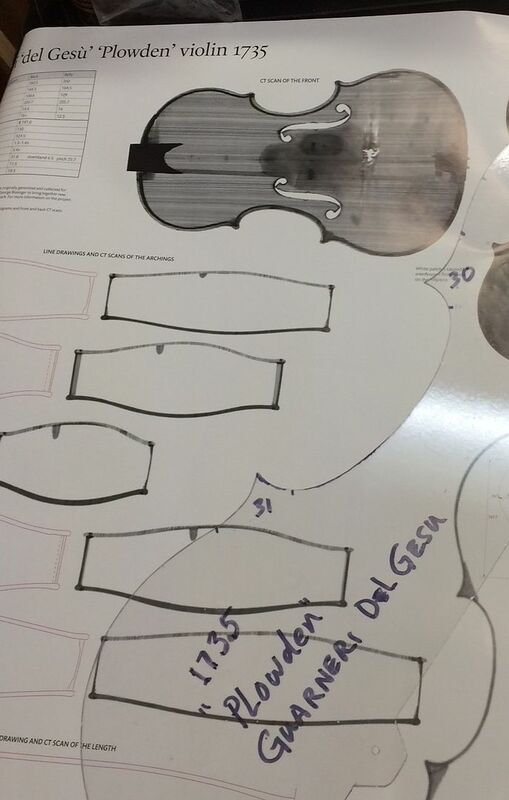 in the midst of these ponderings, I had sent one of my teachers a couple of sets of photos of two of my recent violins, and, while he was quite encouraging and positive, he took the time to give me a carefully-considered, and quite detailed critique (what a treasure!) of both instruments, telling me what changes he would want to see, when comparing my work to one of the Old Masters (Guarneri del Gesu, in particular.) So! 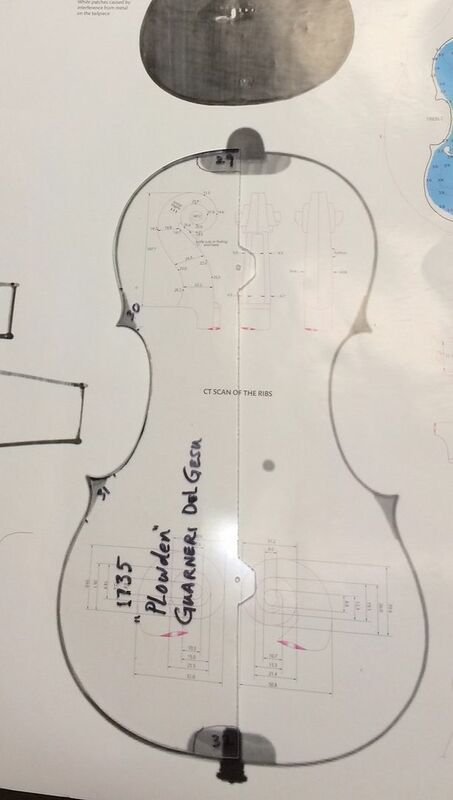 I changed course, and figured that I have just enough time to attempt another copy of the 1735 “Plowden” Guarneri del Gesu violin, of which I already have the “The Strad” poster, with actual CT-scans of the original instrument, and exquisite photos of the outside, along with technical drawings and tables of measurements. Game on! New Project! 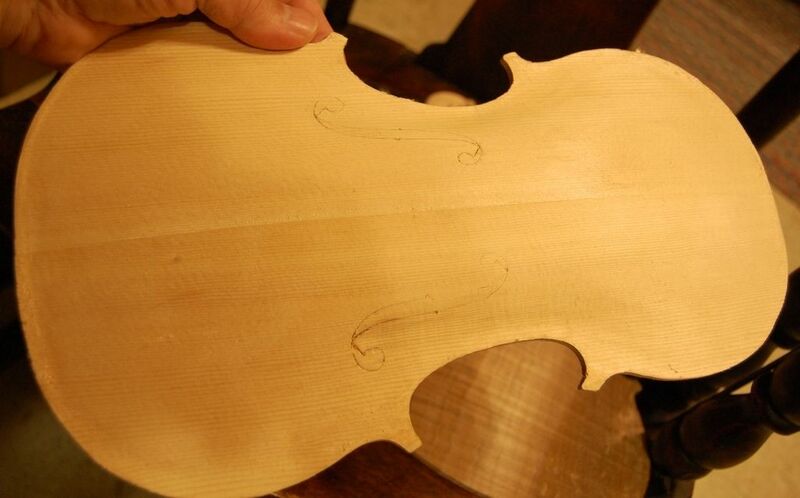 (Bartolomeo Giuseppe Guarneri 1698 – 1744) was a violin maker living and working in Cremona, Italy. 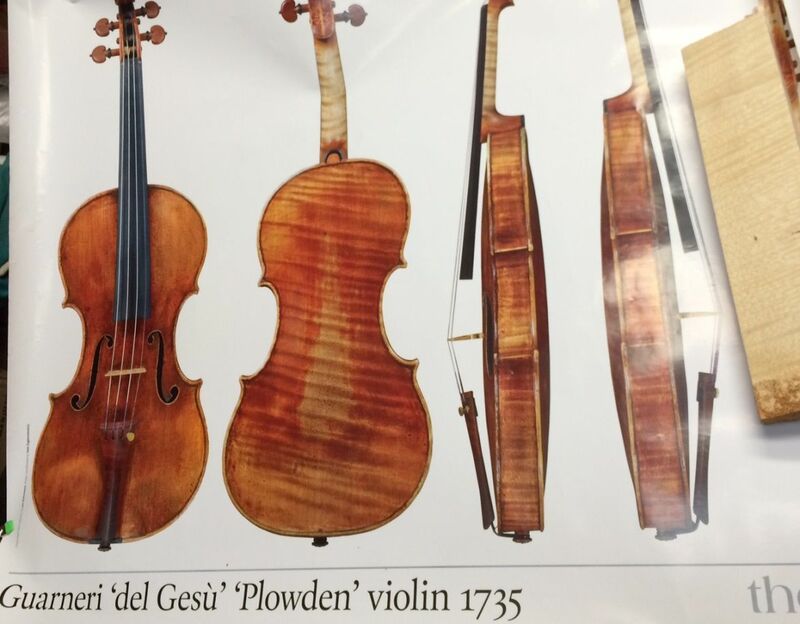 He was one of the sons of Giuseppe Giovanni, and, though he was not very successful in his lifetime as a luthier (having to supplement his income by other means) compared to the more famous Antonio Stradivari, some of his later instruments are highly prized today, and sell for more than perhaps the very best Stradivari violins. Currently the very highest price (undisclosed, but reportedly in excess of $15M) was paid for the 1741 “Vieuxtemps” Guarneri del Gesu, on lifetime loan to Anne Akiko Meyers. 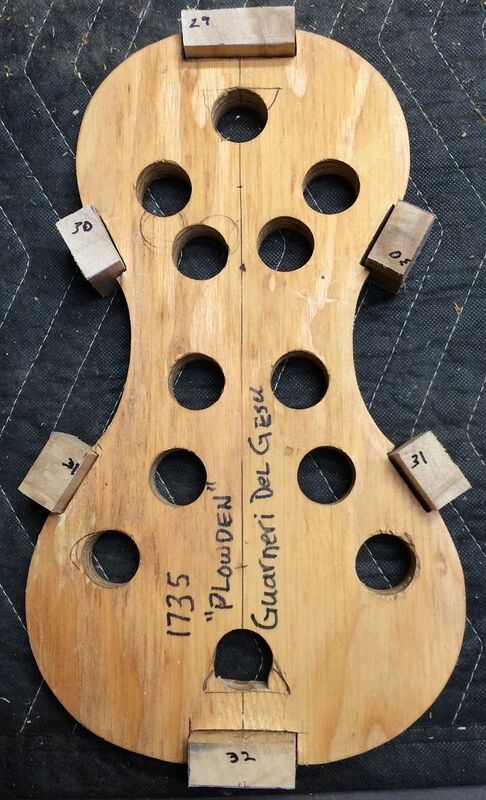 I have never attempted an instrument modelled after the “Vieuxtemps”, but I have made two or three modelled after the 1735 “Plowden.” So that is the chosen model, again. Checking the Mold Template against the Poster CT-Scan…I thought it had been exact, but there were some tiny discrepancies. These are the photos on the poster front. The poster does not want to lie flat– I store it in a mailing tube, to keep it undamaged. Checking the mold against the corrected mold-template: as it turns out, the corrections were all within the areas of the blocks– the mold is fine. Blocks cut and fitted…notice the differing heights, marked on the ends. Blocks glued in place. I use Titebond for this task, but nearly nothing else. Block shapes, as traced from the mold template. 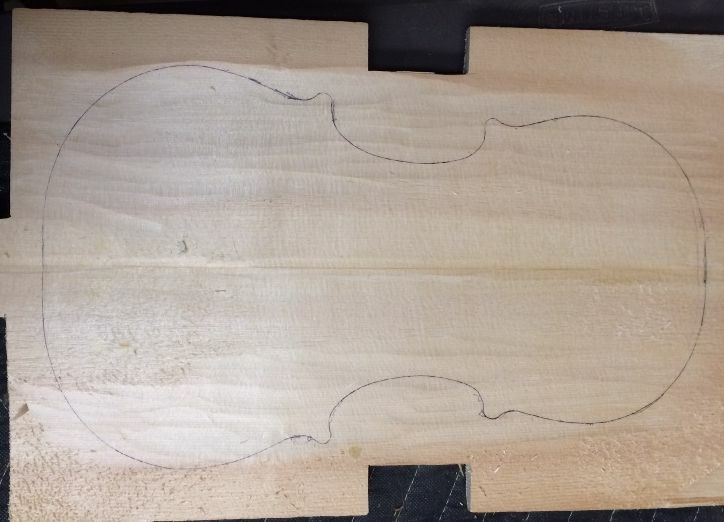 This will be a one-piece back of European Maple, neck and ribs matching the back, and a two-piece front plate of European Spruce. 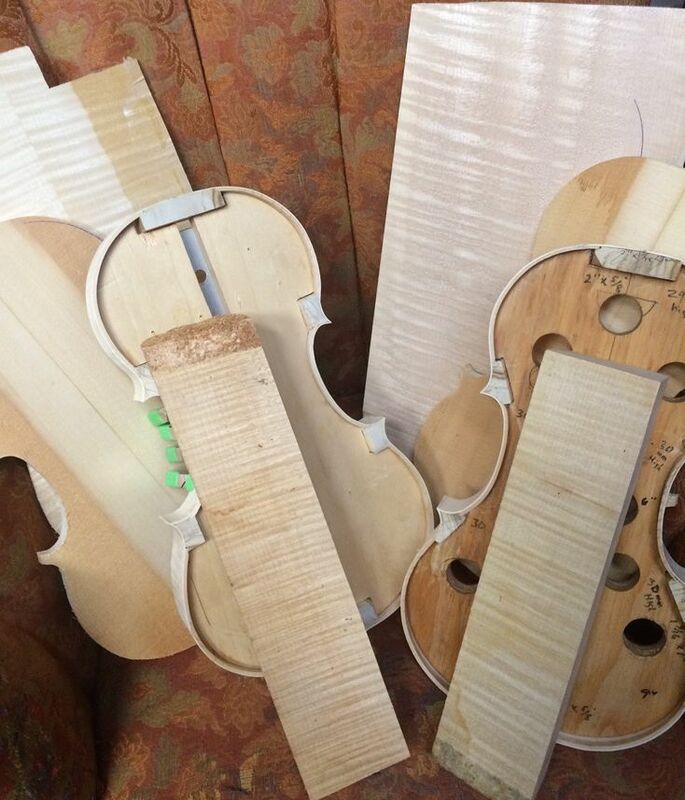 All were obtained from International Violin Co., of Baltimore, MD. 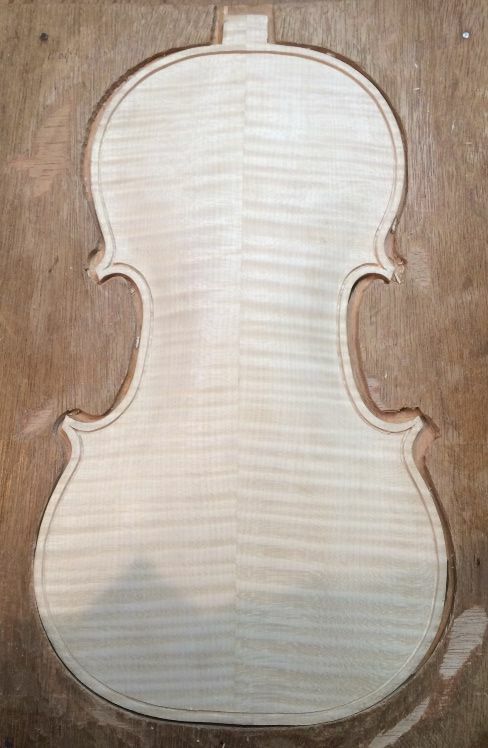 One-piece back, neck and ribs of European Maple, front of European Spruce. 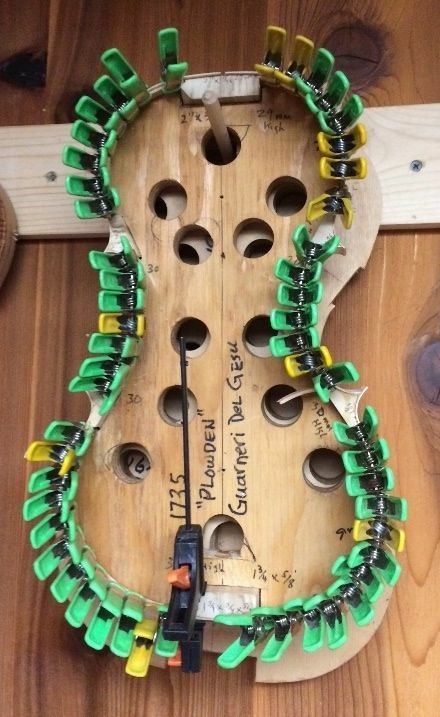 That trace on the back plate was put there by the wood-source people…it does not reflect the shape of this violin at all. So! That is the Beginning! I will carve the inner curves of the center-bout blocks next, so that I can bend and fit the center ribs to match those curves. 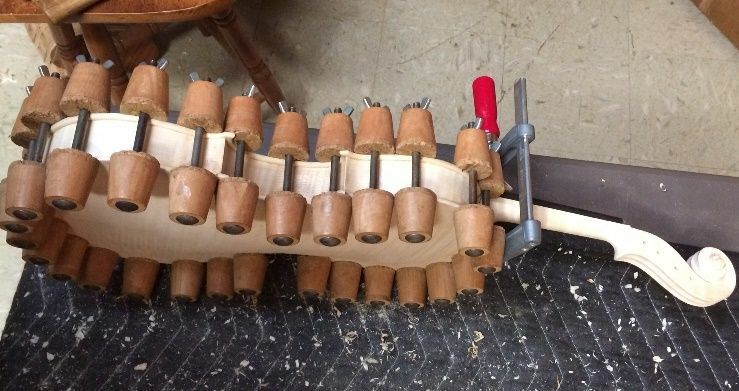 Afterward, I will carve the outer curves of those same blocks as well as the tail and neck blocks, before bending and fitting the upper and lower ribs. Current “State of the Fiddles” report. Slow Progress, But Moving Along! 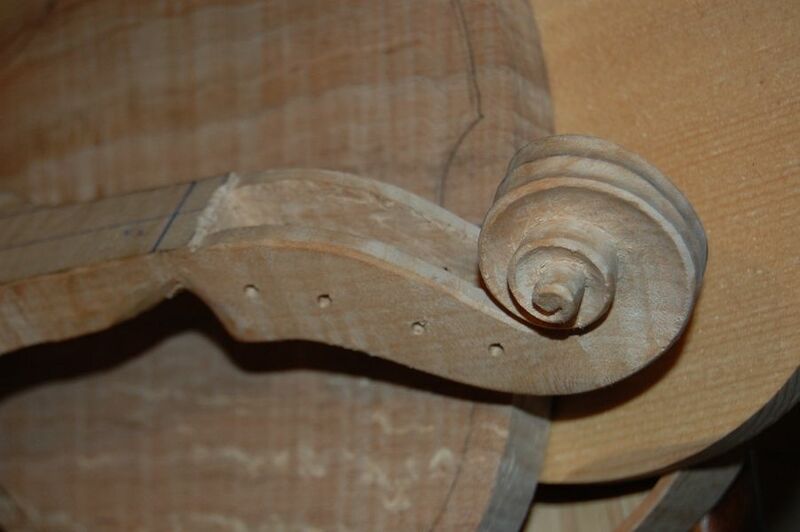 I spent most of Saturday working on carving the viola scroll. 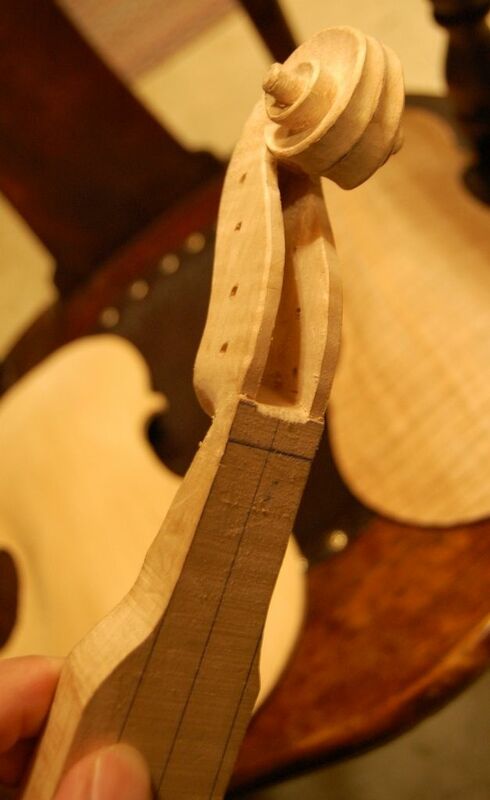 I am not as fast as a lot of luthiers seem to be. It takes me more than eight hours to carve a scroll, and I can’t go at it for eight hours straight, anymore, anyway. So, between the heat and my other responsibilities, this is pretty much all I got done. It is still not complete, of course, but it is looking closer to complete, and it feels encouraging, to look at it. 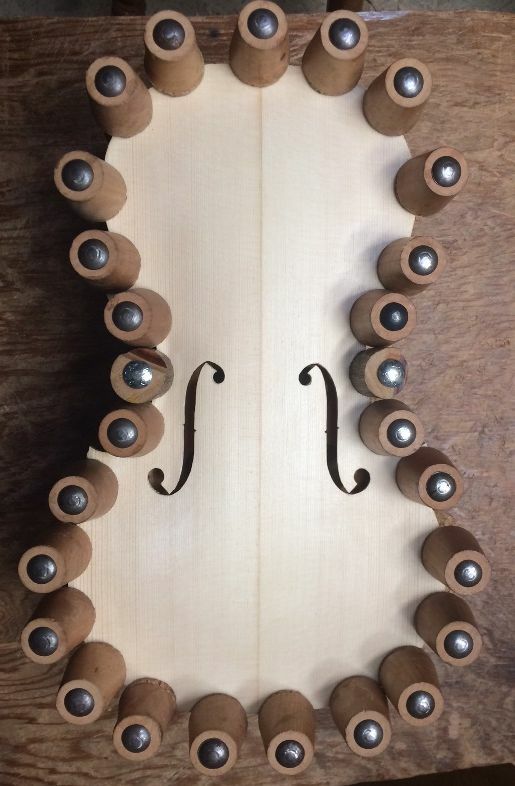 This is a Big Leaf Maple scroll and back, on top of a Sitka Spruce top plate. It is interesting to carve domestic maple in close proximity to European maple. They are not the same at all. The big leaf maple is much softer, and feels almost fuzzy, under the scraper. Much lighter-weight, too, and has a different ring, when I tap it. 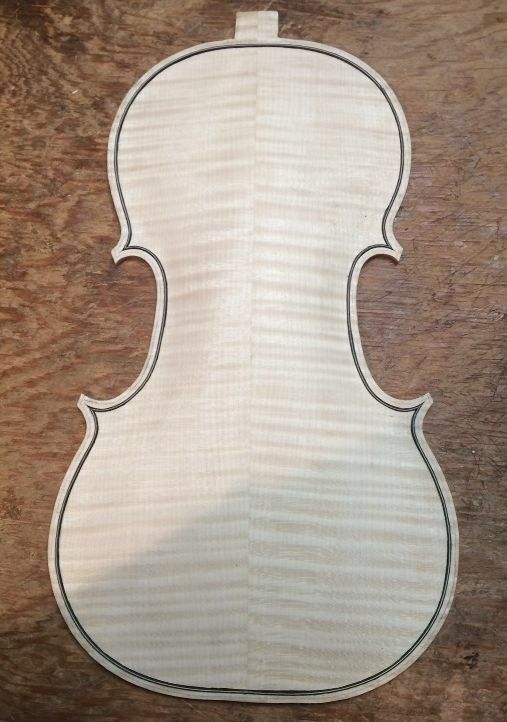 European seemsto be superior for violins, though domestic maples seem to work fime for larger instruments (or possibly it is the lower tones involved.) This instrument will be a good “experiment” in that regard. 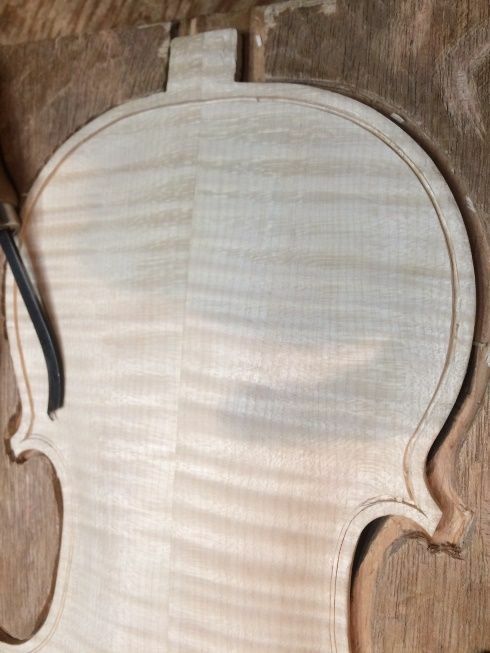 If this instrument is very good, then the lower tone is the issue– if it is questionable, I may repeat the experiment immediately with European Maple and see if that corrects it. If it does, then the size of the instrument may be what is the problem. 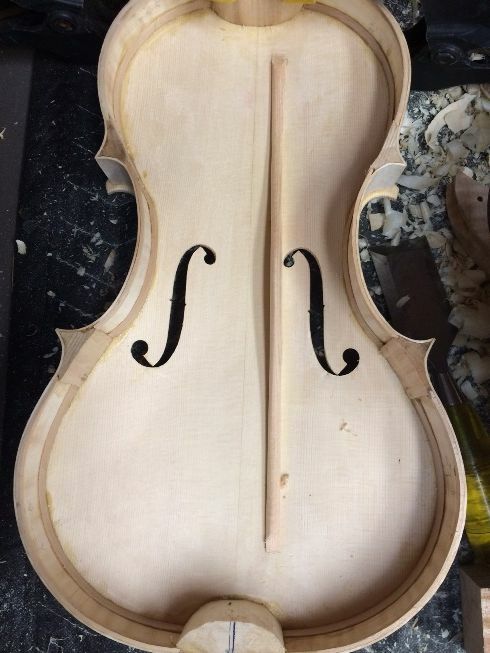 But I suspect it will be a very good viola. 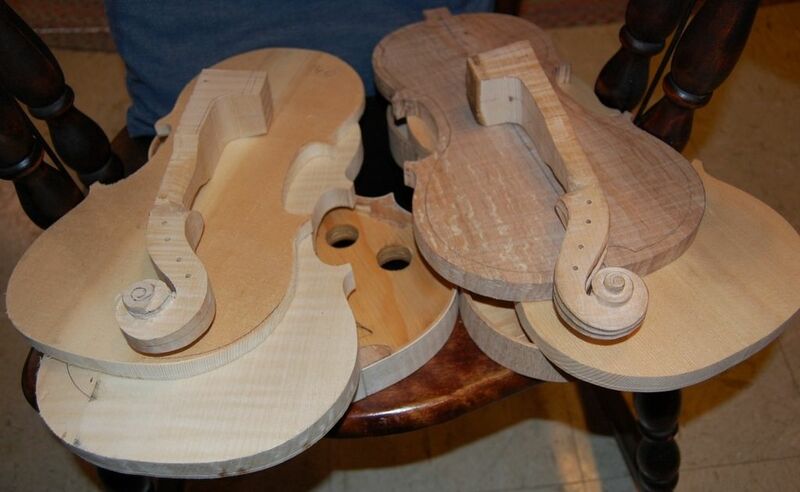 I have made other very small (14-7/8″ on the body) violas using the same woods, before, and they were very good. This will be the smallest I have made, using domestic woods. 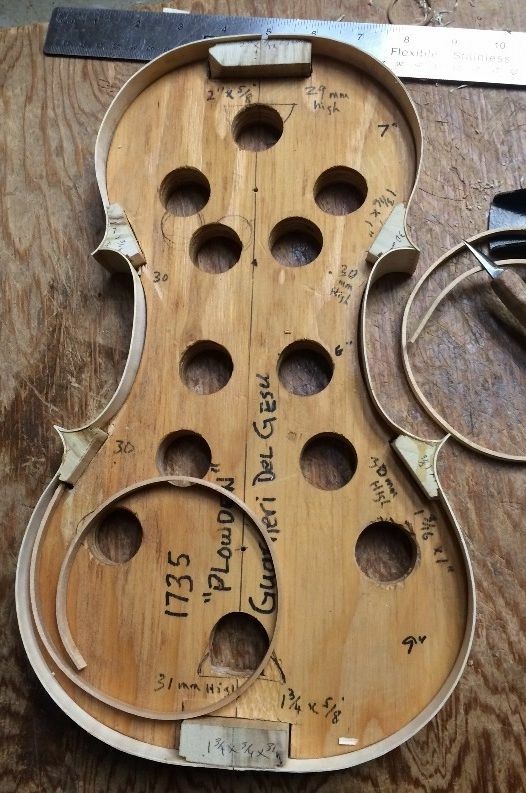 Actually, come to think of it, I did do a little more– I went and used my son’s tools and planed the two violin plates to appropriate thicknesses to start working them. 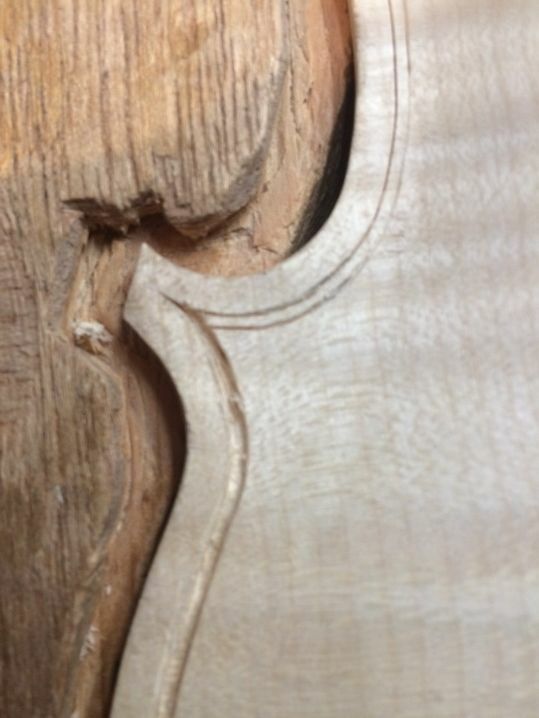 I was shooting for about 17mm thick, to begin with, so that my finished arching will be close to that thickness, after everything else has been carved away. Then I laid-out the shapes of the plates by tracing them from the completed garland, and cut them out at home. So, here is what the whole pile looks like today. Last week, some of the plates were still square and flat, and very thick…this week they are all the correct thicknesses, and one scroll is nearing completion. The lines on the right-hand maple plate (the viola back) are sketching in where the carving will happen on the inside of the plate: I will carve the outside first, to get the exact arching I have planned, then carve the inside to a similar shape, to get the exact thisknesses I hope to achieve (called “graduations” because the thickness is different in different areas, and changes gradually from area to area.) Both the arching and the graduations are critical to the final resulting sound. In my opinion, the arching is probably more important, but I can’t prove it. I do know that when I accidentally arched some of my early violins the way (I later was taught) a viola is supposed to be arched, those violins sounded like violas, in spite of everything else about them being “violin.” It was very perplexing to me, at the time, as my ear was not well-enough trained to hear the difference, and all I knew is that it was a violin! And these crazy players kept telling me it sounded like a viola! They were right! The arching was the issue that decided the character of the sound. Good learning experience. 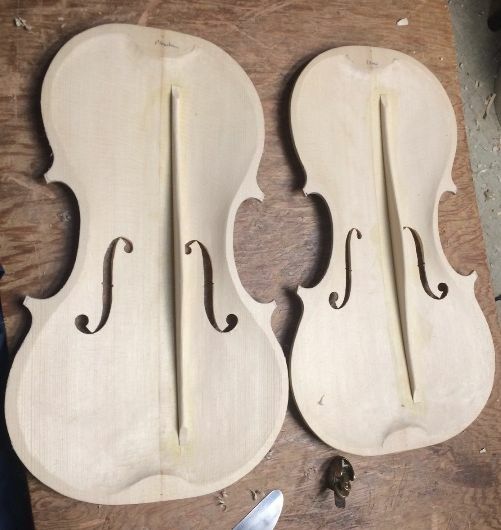 The wood on the left is European maple and spruce I bought from International Violin Co., in Baltimore, MD. I have used their wood before, and it has worked well. Both have linings and blocks made of weeping willow. 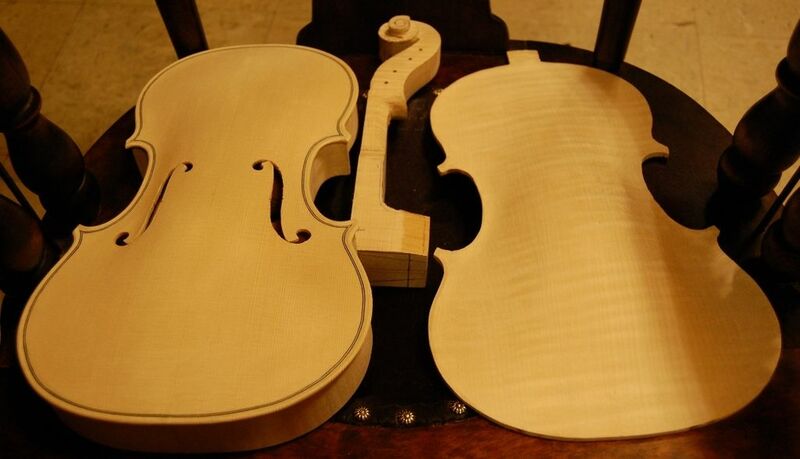 As you can see, both instruments have one-piece backs, and two-piece, book-matched fronts (sometimes referred to as tops, or bellies). 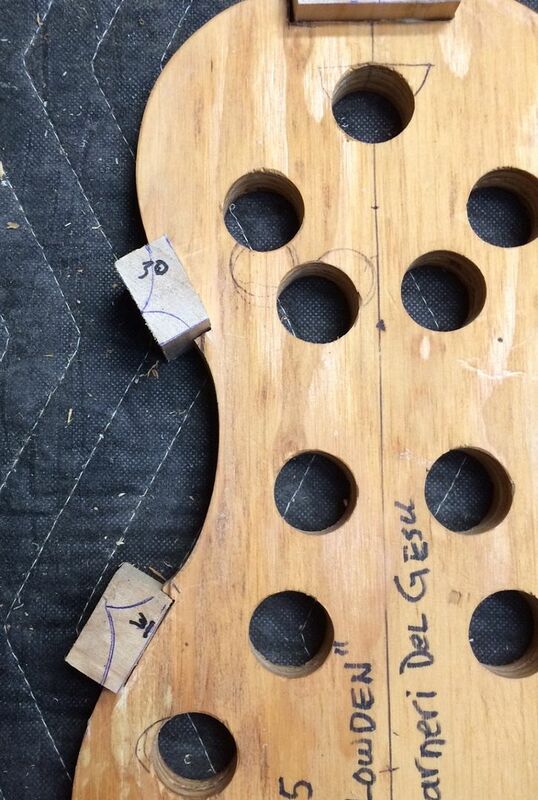 In both cases the ribs and necks/scrolls are of wood matching the back plate.